The small City of Banks (population nearing 1,900) is the gateway to the Oregon Coast, and is known for its superb outdoor recreation. This weekend, grab your cycling shoes for a ride of a lifetime. 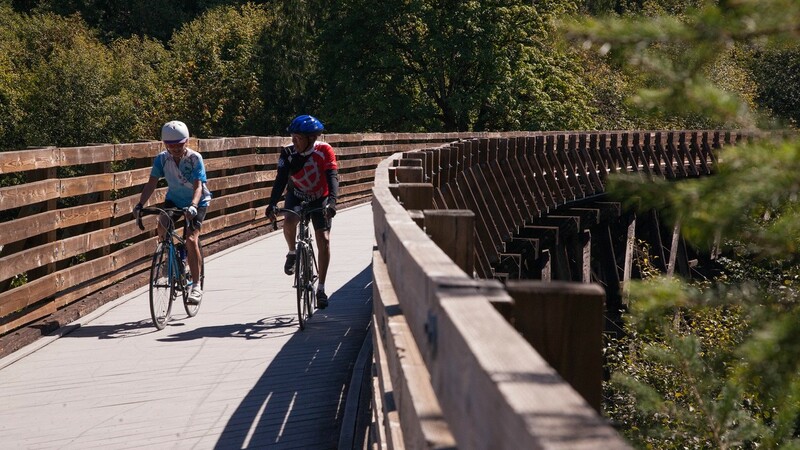 Rent a bicycle–single or tandem–at Banks Bicycle Repair and Rental and head out on the Banks-Vernonia State Trail, a 21-mile linear trail open to cyclists, hikers and horseback riders. This popular path was the state’s first rail-to-trail project and remains one of the most popular multi-use paths in the region. The trail from Banks to Vernonia includes some climbs, so you’re most likely going to pedal up and appetite. When you reach the end of the trail, cycle into downtown Vernonia and grab a bite before heading on the mostly-downhill ride back to Banks. After your ride, return to Forest Grove and grab a pint (or two) of craft beer at Waltz Brewing or Ridgewalker Brewing – you’ve earned it! Have dinner at Ironwork Grill, at McMenamins Grand Lodge, then stay for live music, held each Saturday evening starting at 7 p.m.
Before heading home, drive to the Oregon Coast, about an hour’s drive from Banks, and take in the calming views of the Pacific Ocean and experience the cool breezes of autumn.